But that would leave him right back where he started. Trapped in bed. Unable to eat, clean or dress by himself. What kind of life was that? A lump of flesh in a horizontal position. That wasn’t living. It was barely even existing. The pain didn’t manifest the way they described. It wasn’t a gentle pinch or a numbing tingle. It was fire, searing flames. Agony flashing like lightning through his arm when he punched the soft target. Lances spearing his legs from ankles to thighs when he jogged across the field. Even in bed, at night, with exhaustion weighing his eyelids like heavy weights, the miserable spasms radiated from the bionic connections like individual whip lashes, cramping his muscles and denying him rest. Pain was the price of living again. He paid it every morning when he rolled into a sitting position. When he settled the training uniform over his scarred skin. When he took up the defensive stance across from his combat instructor. Only movement seemed to dispel it. He noticed nothing but the need to dodge when a fist flew at his face. The counter attack seemed easier than the initial strike. The deeper he descended into the lesson, the more he focused on the sparring match, the further the remnants of his injuries fled. That it stubbornly returned remained the only issue. The psychologist suggested meditation. Domerin did his best not to snort with derision until he left the man’s office. It didn’t help that closing his eyes returned him to the very moment his life flew to pieces. Time had only replaced those images with new horrors. The first week of his training when the quiet man who shared his table every day at lunch stuck a gun in his mouth and pulled the trigger. No warning. No goodbye. Only a note scribbled on a post-it that read I can’t take it anymore. Or Johnson, who swore every day during weight lifting he would find a way to work through the pain. “I can’t go back,” he told Domerin every day while they stowed the equipment. “Since there are no second chances, I have to go forward.” Evidently, the months changed his mind. It had only been three days since he took advantage of routine maintenance to seal himself in the airlock. When he closed his eyes now, Domerin saw the look on Johnson’s face when he pleaded with the man to unlock the maintenance panel and come back inside. The look on his face when he mouthed the words ‘I can’t go back,’ and slammed the big red button that flushed him out into space. Was he, too, doomed to give up? To be worn down by the incessant torment that accompanied day-to-day living? Only the combat exercises allowed him to clear his mind. Only turning the growing complexity of his advanced skills training into simplicity granted him relief. War, it seemed, was the answer. Only by lighting a fire greater than the one which already consumed him, could he rise above his suffering to turn tragedy into triumph. He would go to war against the altered state of his flesh, the loss of limb that threatened to tie him forever to the grace of others. 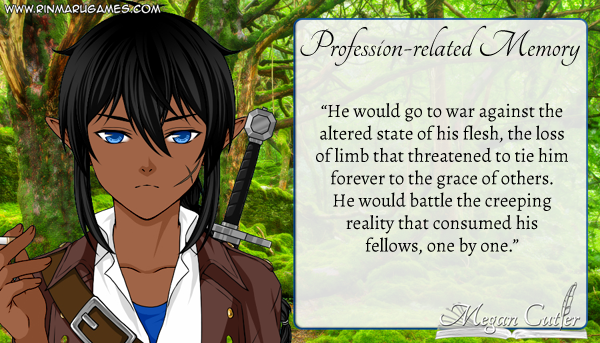 He would battle the creeping reality that consumed his fellows, one by one. And when he possessed the proper skill, he would go to war against war itself. So that no one need ever suffer the misery and pain that made themselves his companions. He whispered it in the back of his mind every time the pain invaded his consciousness, reaffirmed it on his way to every sparring session, invoked it like a prayer over every meal. Domerin embraced his agonies. The sting of his footsteps became a reminder that he could walk. The blistering sensation of returning to rest reminded him that he could act, and those actions might one day impact someone other than him. Turning his torment into a gift made it easier to bear. Going back wasn’t an option. He had to keep moving forward, no matter the cost. Don’t forget to check out my writing partner’s version of this prompt!